FILE - Chinese and American flags fly outside of a JW Marriott hotel in Beijing, Jan. 11, 2018. U.S. officials and politicians say they are increasingly frustrated and looking for ways to fight back against what they see as China's use of its market power to impose "politically correct" behavior on American companies. Airlines, retailers and hoteliers all have been pressured to alter products and promotions that offended Beijing. "These actions are outrageous and disturbing," Deputy Assistant Secretary of State for East Asian and Pacific affairs Alex Wong told American lawmakers Tuesday. 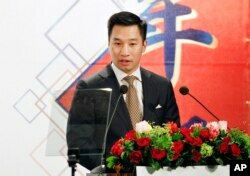 "China is very much well aware that it's wading through treacherous waters here. And they understand that if they continue along this path, continue to employ these tactics, that will negatively affect the U.S.-China relationship and that there will be consequences," said Wong during a hearing at Senate Foreign Relations subcommittee on East Asia, The Pacific, and International Cybersecurity Policy. "The consequences are under review," Wong added. FILE - Alex Wong, U.S. Deputy Assistant Secretary of State, delivers a speech in Taipei, Taiwan, March 21, 2018. His remarks come after American clothing retailer Gap apologized and recalled the sale in the Chinese market of its T-shirts showing a map that's seen by Beijing as politically incorrect. The T-shirts were also destroyed. A Chinese student earlier this week posted pictures of the T-shirt, which did not include Taiwan, parts of Tibet and islands in the South China Sea that Beijing claims are Chinese territories. Gap quickly apologized, citing "unintentional error." Photos circulated on Chinese social media network Weibo were said to be have been taken at an outlet store in Canada. A Chinese government spokesperson took note of Gap's apology and the American company's pledge to respect "China's sovereignty and territorial integrity and is conducting an internal inspection." "We have taken note of this statement. We will continue to listen to its [Gap's] words, and watch the actions," said Chinese Ministry of Foreign Affairs Spokesperson Lu Kang on Tuesday. But U.S. officials and lawmakers are hitting back. 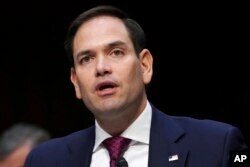 "American companies are being bullied," said Florida Republican Senator Marco Rubio during Tuesday's Senate Foreign Relations Subcommittee hearing. FILE - Senator Marco Rubio, R-Fla., speaks during a Senate Judiciary Committee hearing on Capitol Hill in Washington, March 14, 2018. Rubio said U.S. airlines "are being threatened by China, that if their website doesn't say Taiwan [is part of] China, they're going to lose their routes and have fines and penalties." On April 25, the Chinese Civil Aviation Administration sent a letter to 36 foreign air carriers, including a number of American carriers, demanding the carriers remove references on their websites or in other material that suggests Taiwan, Hong Kong and Macau are independent territories from China. 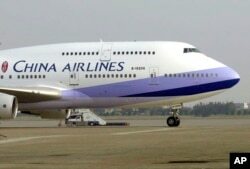 FILE - A China Airlines Boeing 747-400 sits on the tarmac at the Chiang Kai-shek International Airport in Taoyuan, Taiwan. And in January, Beijing requested U.S. hotel giant Marriott International change the way it referred to Tibet, Taiwan, Hong Kong and Macau to be in line with Beijing's views. The request came after a Marriott employee "liked" a tweet by Friends of Tibet that praised Marriott for "listing #Tibet as a country along with #HongKong and #Taiwan" in an online customer questionnaire. The employee was fired and Marriott apologized to Beijing. Observers said market access to the growing population of affluent Chinese consumers leads to American companies' compliance. "It's totally based on market strategy or, more precisely, fear of being shut out of the China market," Brooking Institution's Senior Fellow Richard Bush told VOA on Thursday. U.S. officials said they have raised this issue privately with their Chinese counterparts, while also condemning Beijing's actions in public. U.S. officials have also talked with companies who have been involved in the incidents. China claims democratically ruled Taiwan is part of its territory, and it has never renounced the use of military force to bring the island under Beijing's control. The U.S. broke diplomatic ties with Taiwan in 1979 and has "acknowledged" Beijing's position, while insisting on a "peaceful resolution of cross-Strait differences."